In case you followed our previous articles that tackled the topic of colors, you might now by now why colors are so relevant, why certain colors influence our moods and perception and how we could integrate them better in our marketing strategy. All these being said, we covered far more than simple theoretical approach towards the complex psychology of colors. However, regarding its actual applicability, I considered it might be best to take a deeper look at that in today’s article and come up with some hands on tips that you can apply right away. As I’ve already mentioned before, choosing a color that represents you and your business is a tough job. And despite all the psychological reasons you might have for choosing one color instead of another, at the end of the day what matters the most is why that color represents you, what made you choose that and not something else. The same goes for color schemes. You can find online lots of theoretical reasons why certain colors work better with other, theory on contrast, shades, tints and so on. You can opt for an achromatic color scheme, an analogue color scheme, a complementary and triadic one or a monochromatic one. Think of all the times you send an email, for example. We put on a block of text on a white background. Which makes it a lot easier to read, which is mostly what we aim for. However, this block of text lets enough room for playing around with colors and maybe even images. If you have your block of text divided in different topics, you could use colors or blocks of colors to separate them, to make them stand out more. Although, as mentioned above, we are used to having an email with black writing and white background, hence the saying “black on white”, it doesn’t mean this is the only possible way to go. The idea is to not overdo it and have the rainbow in your email. Keep it simple and consistent. Even if you stick to one main color, think that you are already doing more than the majority of people. 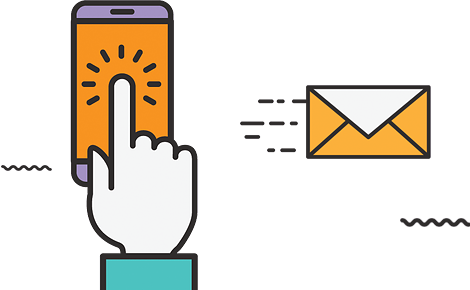 As I already mentioned in our of our previous articles, a study made by Hubspot, based on A/B testing, showed that a red call-to-action button had a better conversion rate by over 21%. This does not mean that all the CTA buttons you want to have on your page have to or should be colored in red. On the contrary. It just means that you should pay attention to them and organize them in such a manner that they stand out and they are easily observable. Once again, the easy and usual way is to merely leave them blue. However, just think that they might stand out better if they have a different color. It does not only help you better organize the information you have to share but is also a great alternative for images. Once again, it’s a great opportunity to make your mark when it comes to creating your brand and make the navigation an easier business for the user, and a more pleasant one. After having emphasized it so much in our previous articles, I believe we have to say no more how important the testing is. Before actually sending out an email, whatever changes you made to it, whatever adjustments, don’t forget to test it. It’s far easier than waking up with unpleasant surprises. Let us know what you think of these tips and if you have anything else we might add to our list, anything that worked for you or that you consider trying. What are the best email marketing platforms currently out there?